This campaign is in partnership with UltraViolet. Would you like to receive email updates from them? I would like to receive updates from UltraViolet. UPDATE: Jacqueline is currently out of jail, but the charges still remain and District Attorney Michael Jackson will likely send it to a grand jury. "Stand Your Ground" laws prove once again that they do not protect Black people. In Alabama, a young 38-year old Black woman Jacqueline Dixon was arrested and charged with murder for killing her husband Carl Omar Dixon on the morning of July 31st after an argument in which her husband attempted to attack her. But this is not the full picture. Jacqueline is a survivor of domestic violence. She endured years of abuse at the hands of her husband. In 2016, the courts rightfully granted Jacqueline an order of protection from abuse against her husband and received tempory custody of their two young children. She clearly still lived in fear and suffered tremendous harm from her husband. Alabama has the "Stand Your Ground" law. But Jacqueline, who used deadly force to protect herself against a known abuser, is locked up in jail with a bond set at $100,000. The case is eerily similar to Marissa Alexander, who is also a Black woman who survived domestic violence. Marissa fired a warning shot to protect herself and her children when her ex-husband charged towards her. Marissa was arrested and initially sentenced to over 20 years behind bars. Yet white men such as George Zimmerman, who viciously murdered Trayvon Martin in 2012 after following and bullying him and just recently, Michael Drejka, who shot and killed Markeis McGlockton over a parking spot, were both set free to go by their local sheriffs. Black people are punished and even killed because of the "Stand Your Ground" law. Black people, especially Black women survivors of violence, are never given the right to protect and defend themselves. If the law is supposed to be about self-defense, then Jacqueline Dixon should not be prosecuted. This should be a moment to focus on her and her children's safety and well-being. Dallas County District Attorney, of Selma, AL, Michael Jackson must consider the full picture of the pain and trauma Jacqueline Dixon has experienced. Jacqueline does not deserve prison. She deserves a community and support network that will help her and her family heal from this tragic ordeal. All charges must be dropped now. Jacqueline must come home. 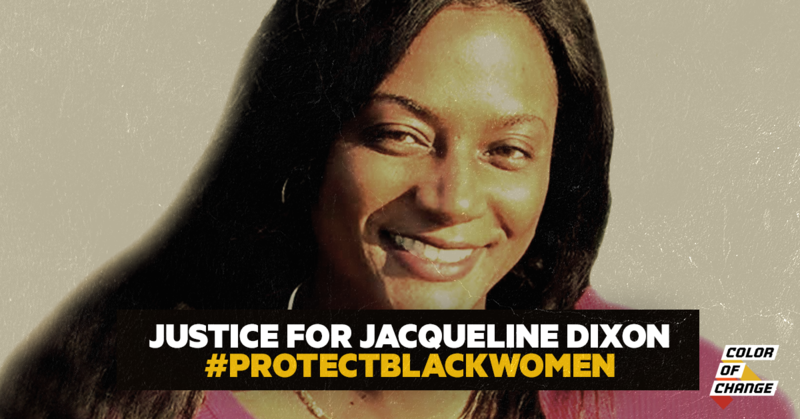 We urge you to drop the murder charges against Jacqueline Dixon. According to the "Stand Your Ground" law, she was using self-defense. Jacqueline Dixon has a history of surviving abuse. Many women who are survivors of domestic violence already experience the trauma of violence against their partner but to also experience limited protections from the justice system is cruel. If the law works, there is no reason for Jacqueline to be in jail, let alone with a high bond. The charges must be dropped now. Jacqueline must return home safely with her family.